Or pick up both for $42 $24. It’s a fool’s errand really. We’ve been trying for over six years now, and frankly, we’re not getting any closer to a definitive answer. We know, without a doubt, that book and place do affect each other, and that they are bound as a single experience in our memories. Complicating the quest for a tidy conclusion is the fact that sometimes the place where we read a book is not just a geographical spot but also a psychological one. In fact, the most compelling Field Tests in this collection are the ones in which a book, a physical place, and a significant emotional moment collide. So rather than trying to prove the unprovable, we act like good scientists and we observe. We conduct Field Tests. We look over the shoulders of lots of smart people while they read lots of interesting books in lots of familiar and unfamiliar places and see if we can detect patterns. We hope you’ll find inspiration while browsing the online or printed collections. We certainly have. It’s been said many times that “books take you places.” It only seems right to return the favor. 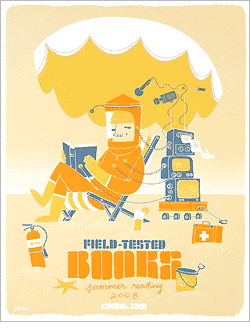 New to this edition of Field-Tested Books is something we've wanted to do since we first had the idea in 2003. We’ve collected many of the reviews into an honest- to-goodness physical book. Buy a book here, and be sure to check out this year’s poster by Spike Press and a short film we made about the artist behind it, John Solimine, The Beginning and the End Are Up To You. We’re also interested in more stories about a “certain book read in a certain place.” with 300-500 words about a book you read somewhere. We’ll select some for publication in our growing collection and send those authors a copy of The Field-Tested Books Book and some other stuff too. Finally, thanks a million to all the people who shared their Field Tests with us over the years.